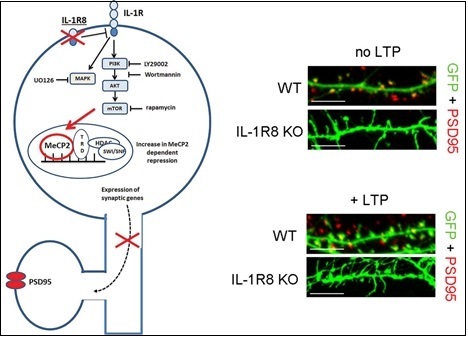 Lack of IL-1R8 in neurons causes hyperactivation of IL-1 receptor pathway and induces MECP2-dependent synaptic defects. Errors that occur while the brain is developing can lead to conditions such as autism and schizophrenia. They can also lead to rare disorders like Rett syndrome and MeCP2 duplication syndrome, which are characterized by severe cognitive and physical disabilities. Many people with neurodevelopmental disorders have mutations in genes that encode proteins found at the synapses, which are the junctions between neurons where the cells exchange information with one another. However, not everyone with these mutations develops a neurodevelopmental disorder, which indicates that other, non-genetic factors also play a part. One of the main non-genetic factors that can influence the risk and severity of neurodevelopmental disorders is inflammation of the brain. Although inflammation is a normal part of the body’s immune response to threats such as invading microorganisms or tissue damage, abnormal activation of the immune system in early life can trigger excessive inflammation. This increases the risk of a neurodevelopmental disorder, but it is not clear exactly how it does so. Tomasoni and her colleagues at the IRCCS Humanitas in Milan and the Instituto de Neurociencias (UMH-CSIC) in Alicante set out to test whether the missing link between inflammation and neurodevelopmental disorders might be damage to synapses. The experiments revealed that genetically modified mice with inflammation of the brain have abnormal synapses and are unable to learn properly. These mutant mice also have excessive levels of a protein that influences how synapses function called MeCP2, which is missing in the brains of people with Rett syndrome and abnormally increased in brains of patients affected by MeCP2 Duplication Syndrome. Genetic correction of MeCP2 levels in these animals rescues the synaptic defects.This represents the first evidence that directly links inflammation of the brain to this protein critically implicated in neurodevelopment disorders. Tomasoni et al. also found that a drug called anakinra – which is used to treat an inflammatory disease called rheumatoid arthritis – reduced levels of MeCP2 in the mutant mice and improved their performance in cognitive tasks. Together, these results raise the possibility that anti-inflammatory medications may be beneficial in the treatment of certain neurodevelopment disorders. This work is led by the researchers Romana Tomasoni and Michela Matteoli from IRCCS Humanitas in Milan (Italy), and includes the collaboration of researchers Jose P. Lopez-Atalaya and Angel Barco from the Instituto de Neurociencias (UMH-CSIC) in Alicante. Left: Cartoon depicting the activation of IL-1R and its signaling cascades leading to the increase of MeCP2 expression, which is turn responsible for the altered levels of synaptic proteins. Right: IL-1R8-/- neurons have immature spines that are not able to undergo chemical long-term potentiation (LTP).